The U.S. Patent and Trademark Office (USPTO or Office) working hours are 8:30 a.m. to 5:00 p.m., Monday through Friday, excluding federal holidays in the District of Columbia. Outside these hours, only USPTO employees are authorized to be in areas of the USPTO other than the Public Search Facilities. The hours for the Public Search Facility in Alexandria are 8:00 a.m. to 8:00 p.m., Monday through Friday, excluding federal holidays in the District of Columbia. See subsections II and III below for information regarding public access to, and conduct on, USPTO premises. When the USPTO is open for business during any part of a business day between 8:30 a.m. and 5:00 p.m., papers are due on that day even though the Office may be officially closed for some period of time during the business day because of an unscheduled event. The procedures of 37 CFR 1.10 may be used for filing applications. Information regarding whether or not the Office is officially closed on any particular day may be obtained by calling 1-800-PTO(786)-9199 or (571) 272-1000. 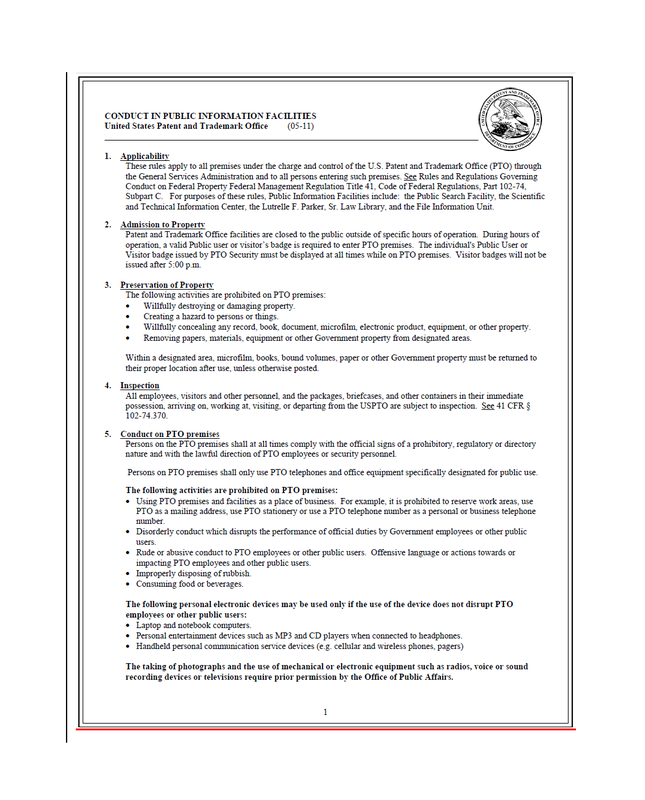 The USPTO has established procedures and regulations governing public conduct on all Office premises, and additional regulations specific to the use of public information facilities, including the Lutrelle F. Parker Sr. Public Search Facility, the Scientific and Technical Information Center, and the File Information Unit. The USPTO instituted new access control procedures that may affect visitors to the USPTO campus effective Monday, August 4, 2014. See www.uspto.gov/page/new- rules-may-adjust-how-some-visitors-can-enter-uspto-buildings for more information. A valid Public User or Visitor’s badge is required to enter USPTO facilities. This badge can be obtained from the Office of Security next door to the Public Search Facility located on the first floor of the Madison East Building, 600 Dulany Street, Alexandria, VA 22314. User badges will be issued to persons not under prohibition from using the search facilities who sign an application form and acknowledge receipt of a copy of the noted regulations. User badges are nontransferable and are valid until reissue or revocation for cause. Office employees must show their Building badges in order to enter the Patent Search Room. An On-line Service Card is required for access to all Public Search Facilities and on-line systems. On-line Service Cards are obtained at the Public Search Facility Receptionist Desk on a user’s first visit. Persons violating the regulations governing public conduct on Office premises (reproduced below) may be denied the use of Office facilities, and may further be subjected to prosecution under the Criminal Code. Additionally, the name of any person violating these regulations who is registered to practice before the Office may be forwarded to the Office of Enrollment and Discipline for appropriate action under 37 CFR Part 11. In addition to the rules set forth above with regard to public conduct on USPTO premises, authorized members of the public using the facilities of the Technology Centers (TCs) are required to follow the rules set forth below. (A) TC facilities are defined as those areas in Carlyle (Alexandria, VA) where the TCs are located. (B) The use of the TC facilities is strictly limited to the regular business hours of the USPTO, i.e., between the hours of 8:30 a.m. and 5:00 p.m. on regular business days (see subsection I above). (C) Authorized Officials, under these regulations, include Supervisory Patent Examiners and TC Directors. (1) No records, or other documents of the USPTO shall be removed from the TC facilities except by express written authorization by an authorized official in the TC where the material resides. (2) The presence or use of equipment such as dictation equipment, reproducing machines, typewriters, and photographic equipment is prohibited without prior permission from an authorized official in the TC where the use is intended. (3) All packages, briefcases, or other personal effects brought into the TC Facilities are subject to search by authorized officials upon request and must be removed when leaving the TC facilities. 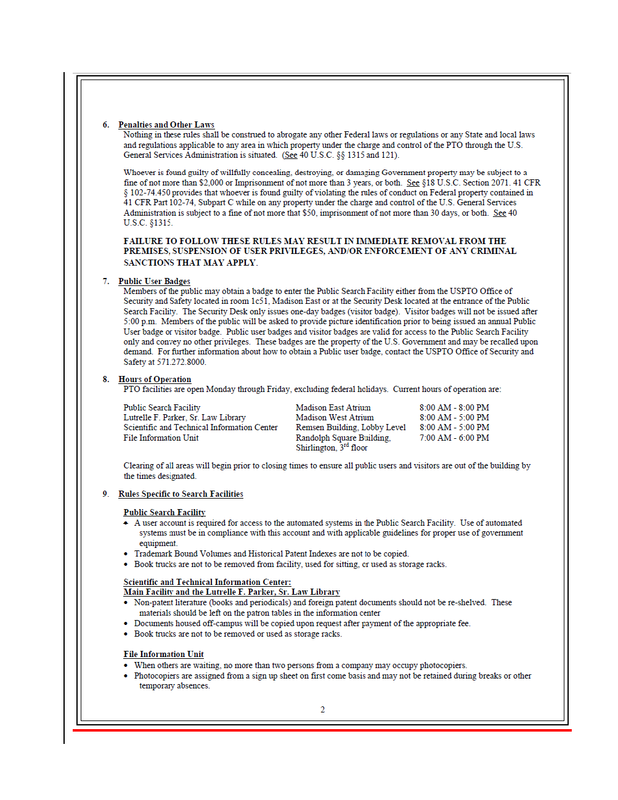 (4) All verbal requests for compliance with these regulations or other posted USPTO Notices pertaining to activity in the TC facilities, when made by authorized officials, must be promptly complied with. (E) Persons violating these regulations may be denied the use of the facilities in the TC and Office public information facilities, and may further be subject to prosecution under the Criminal Code. Additionally, the name of any person violating these regulations who is registered to practice before the USPTO may be forwarded to the Office of Enrollment and Discipline for appropriate action under 37 CFR Part 11. If any individual is observed in violation of any of the regulations, immediate compliance should be courteously requested. If a verbal request is not complied with, a note should be made of the individual’s name and Visitor or User badge number, if possible (the badge is required to be prominently displayed) and a report of the incident should be made to the Supervisory Patent Examiner, Supervisory Applications Examiner, or other appropriate supervisor who will take further action. In addition, if any individual in TC Facilities appears to be a stranger and is not wearing a Visitor badge or User badge, some identification, such as a Visitor, User, or Building badge (issued to Office employees and contractors), should be requested. If the individual refuses, notify a supervisor. Consequently, all Office employees are expected to carry their Building badge with them at all times. Supervisors, when aware of violations of the posted regulations, should prepare a memorandum detailing the facts of the incident and forward this memorandum to the Deputy Commissioner for Patent Operations via their TC Director. Supervisory Patent Examiners and TC Directors are authorized to demand surrender of a User or Visitor badge on-the-spot. If the Supervisory Patent Examiner exercises this function, the TC Director should be immediately notified, followed up by a memorandum as previously set forth.